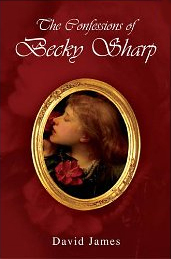 Becky Sharp is possibly the first most rounded woman character in literary fiction. Originally created by William Makepeace Thackeray in Vanity Fair she is a woman of low station forced to survive in a world of status and snobbery dominated by the whims of wealthy men. Thackeray describes her warts and all with a tinge of sympathy but she is one of several such characters paraded in his famous novel. David James takes her character a stage further as he explores how she became the woman she is. When the book opens she is old and reflecting on her life as she writes her memoirs and counts herself among the literary contemporaries of her time, Charles Dickens and Elizabeth Gaskell. She is motivated more by money than by any ambition to be a great novelist as she hints that for the right financial rewards she can leave out some of the more scandalous exploits of her much richer acquaintances and endeavours to put right the injustices done to her by Thackeray in his novel. It is a fascinating device used by a skilful storyteller and the book is well worth the read. The Confessions of Becky Sharp by David James is published by Vanguard Press. This entry was posted on Thursday, April 25th, 2013 at 3:46 pm and is filed under Book Reviews. You can follow any responses to this entry through the RSS 2.0 feed. You can leave a response, or trackback from your own site.